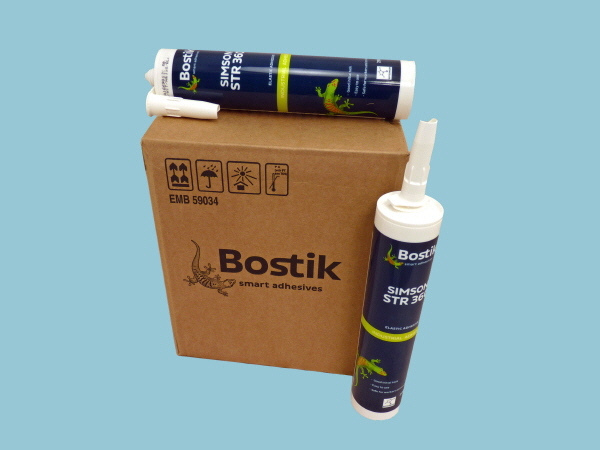 Bostik Simson STR 360 Structural adhesive, enables you to fix your solar panel to a variety of surfaces including caravans and motorhomes without the need to drill any holes! STR 360 is a Silyl Modified Polymer (SMP) based adhesive with a high tensile strength and is suitable for making elastic constructive joints. Elastic bondings and sealings in e.g. bus-, caravan- and trailer construction. Bonding of metals, glass and plastics. Good UV-resistance and ageing properties. In general STR 360 adheres well without primer on clean, dry, dust- and grease free substrates of aluminium, stainless steel, galvanised steel, zinc, copper, brass, powder coated metal, most lacquered metal surfaces, glass, PVC, polyester (GRP), painted and lacquered wood, etc. No adhesion on untreated polyethylene, polypropylene and teflon. In case of high adhesion demands the use of Simson Prep M is recommended. Prep M degreases and prepares the surface of the substrate in one step. On plain, untreated wooden surfaces and other porous substrates Simson Prep P is recommended. In case the joint is exposed to UV radiation the bond surface has to be protected by UV-blocking methods like Simson Prep G. For more details concerning Prep M, Prep P and Prep G consult the specific technical information data sheets. For not mentioned substrates and additional information consult Bostik.